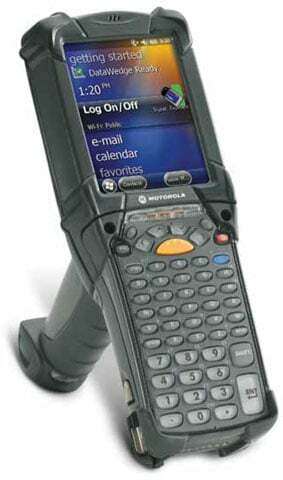 Motorola MC9200 - Wi-Fi (802.11a/b/g/n), 1D Long Range Laser Scanner (LORAX), Windows Embedded 6.5, Gun Grip, VGA Color Screen, 1GB RAM/2GB Flash, 53-Key Keypad, Microsoft Office, Bluetooth, IST, RFID Tag. Interface cables and charging cradle sold separately. For Single Slot Charging Cradle Kit (Part# CRD9000-110SES). For 4 Slot Charging Cradle (Part# CRD9101-4001CR), Power supply (Part# PWRS-14000-241R), DC cord (Part# 50-16002-029R) and AC line cord (Part# 23844-00-00R). The MC9200 gun-style mobile computer is the next generation in the rugged MC9000 Series, the industry leading gold standard for mobility in demanding environments. You get the same signature features that make up the foundation of every MC9000 Series mobile computer "" rugged design, best-in-class barcode scanning and dependable operation "" now with the power to run today"s highly-intuitive applications to help increase productivity and task accuracy in your warehouse, manufacturing plant, airport or military bases. Added support for 802.11n, the fastest Wi-Fi connection available today, allows you to give your workers the best possible wireless voice and data experience. Since the MC9200 is compatible with the MC9000 Series accessories you already own, you can cost-effectively upgrade to the latest technology. And with millions of MC9000 Series mobile computers at work every day, all around the world, you get well-proven technology you "" and your workers "" can count on. The Motorola MC92N0-GJ0SYEQA6WR is also known as MOT-MC92N0GJ0SYEQA6W	or MC92N0GJ0SYEQA6WR	.